Alzheimer's Society has partnered with people affected by dementia, LGBT+ communities and key organisations (including Switchboard in Brighton and Hove) on a series of resources, including a video, booklet, online hub and posters, to raise awareness and understanding of challenges faced by LGBT+ people affected by dementia. Bring Dementia Out is being tested out in the two locations (Brighton & Manchester) over January and February this year. Chris who is living with dementia, lives with her partner Heather in Eastbourne, and often come to visit Brighton. Chris said: "Often LGBT+ people feel isolated in their world from families, friends and work places, especially if those people do not know of a person's sexuality or gender identity. "It is often easier to try to live a life and not identify as being LGBT+. If an LGBT+ person gets a diagnosis of dementia this is life-changing in itself, couple that with being 'in the closet' about your sexuality or gender identity is even more devastating. "The Bring Dementia Out innovation goes a long way to ensure that LGBT+ people can speak in a safe environment and get the support they need without any fear of being discriminated against. "This is vital to avoid further discrimination and provide support for LGBT+ people affected by dementia. "It is even more important for LGBT+ people receiving a dementia diagnosis who do not have the support of a partner or family." LGBT+ people with dementia may start to have strong memories of distressing experiences from an earlier part of their lives, when they may have faced discrimination or stigma. This can be particularly troubling for trans people who may start to have much stronger memories of a time before they changed their gender, and may think they are living in this time. It can make day-to-day things like going to the toilet or getting dressed confusing and difficult. "Bring Dementia Out recognises that while everyone"s experience of dementia is unique, there can be many challenges that are specific to a person"s sexual orientation or gender identity. "We are calling on individuals, organisations and social care professionals to visit the online hub – alzheimers.org.uk/bringdementiaout – to learn about these challenges and take action to ultimately help people affected by dementia from LGBT+ communities feel safer, listened-to and understood. 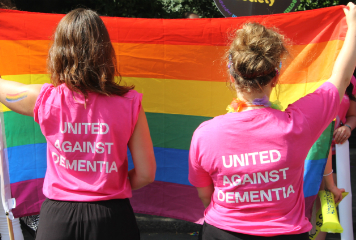 "LGBT+ people affected by dementia have told us they feel there currently isn't a safe and secure "go-to" place for support and that they don't feel connected, and that services are not geared towards them. "We wouldn't be at this stage of testing Bring Dementia Out without everyone who has innovated with us, including people affected by dementia, national and local organisations and LGBT+ communities." LGBT+ people affected by dementia may also fear discrimination from health and social care professionals, and so might not feel able to be open about their sexual orientation or gender identity when accessing services. This may be more pronounced if the person is part of a community that is less accepting of LGBT+ people – for example if they have migrated from a country where it is illegal to be LGBT+. Some LGBT+ people affected by dementia feel isolated, especially if they may have no long-term partner or family to support them. Their 'chosen family' may consist of close friends rather than traditional family relations and these people are often not included in conversations about their care and support. The Bring Dementia Out innovation is being tested in Brighton and Hove and in Greater Manchester until the end of February. Visit alzheimers.org.uk/bringdementiaout to find out more about how you can help LGBT+ people affected by dementia.